Most Cincinnatians may not know where East Alley is, in relation to the rest of the city. They certainly cannot be blamed for that. East Alley is a neighborhood alley like so many others, originally established to provide public rear access to residential (in this case) and commercial properties). Located in the southwestern corner of Mt. Auburn, many city folks may think that the grid of streets near East Alley are in Over-the-Rhine. Its situation in Mt. Auburn is a significant circumstance, as most of Over-the-Rhine is moderately protected as a National Historic District, while the study area is not. 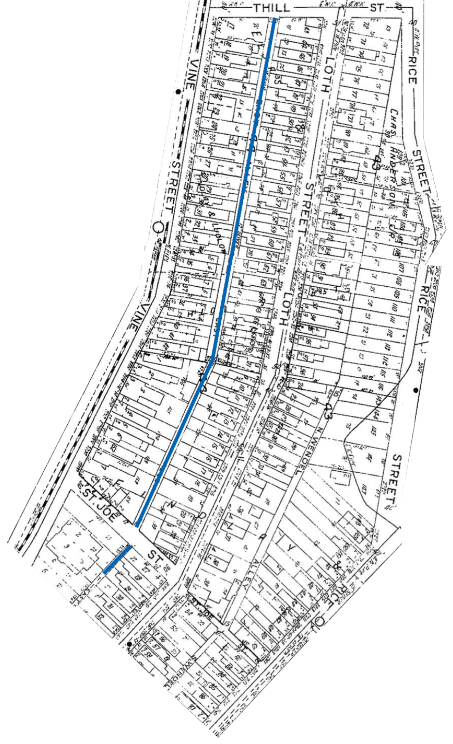 That designation protects the bulk of street corridors from demolition. The nearby streets to East Alley–St. Joe St., Thill St., Loth St., Wendell Alley, and Rice St.–can be characterized by high vacancies and a majority of razed properties. 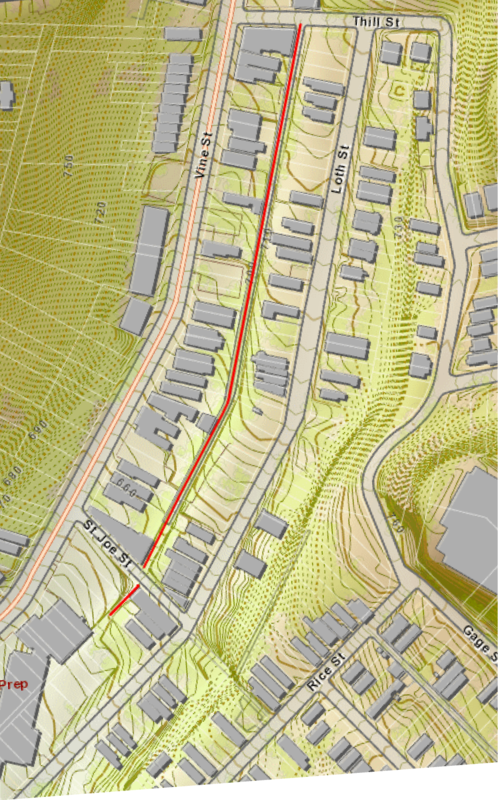 It is because of the latter point that additional streets cannot be grouped with the aforementioned. The plentiful gaps in the residential fabric also isolate these few streets from surrounding infrastructure and public knowledge. Subsequent razing of most of the block bounded by Mulberry St., St. Joe. St., and Loth St.–due to the 1886 and 1964 incarnations of the Vine Elementary School (currently the temporary site of Rothenberg Preparatory Academy)–represents the institutional demolition at hand. The area surrounding East Alley was once an active, high-density residential area. In 1922, St. Joe St. was bound by a school, instead of a chain link fence and a parking lot. Residential properties on Vine St. and Loth St. filled out the block, giving more utility to the alleyway. The vacancy ratio of properties abutting East Alley, from 1922 to 2011, exceeds 50 percent. 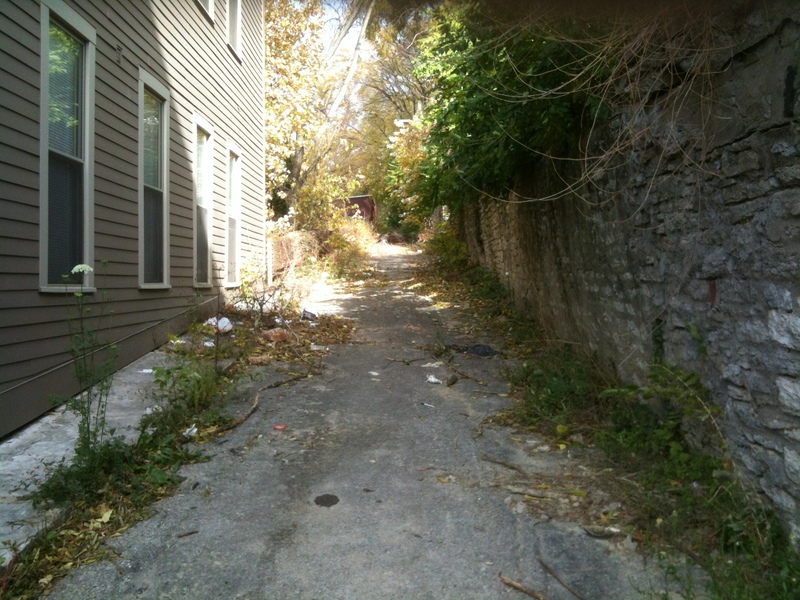 The current project started off with East Alley is fairly deplorable condition. The overgrowth alone renders the alley unnavigable. Illegal dumping, broken glass, and years of decomposition also make East Alley unsafe for mobility of any kind. The first step is to remove weeds and small tree growths. This will clear the way for litter removal and sweeping up glass chards. Subsequent goals include some finishing touches to make the alley more inviting, as well as a search for a nearby resident or block club to “adopt” the alley for continued maintenance. The end result, we hope, is a renewed interest in East Alley, and grasping the attention of the city for rehabilitation and strategies for drainage. This project began on December 12th, 2011. Map images taken from the OhioLINK Digital Resources Commons and Cincinnati Area GIS. This is a great project. I drive through that area regularly, but didn’t know the alley even existed. The entire area has huge development potential with the cliff and views right above it off Rice Street, with a small park too. The key issue is whether the residents care–and if so, getting them to “lead” themselves. It’s hard to bring an idea to a community that doesn’t ask for the help, and it’s hard to get them to invite outsiders to lead such an effort. Jeff, it seems that many of these spaces are “right off the beaten path”, even if they are simply between two buildings along our commute route. I think it would be valuable to identify the primary stakeholders, notably the owner-occupied units in the vicinity. As in any community, they are the easiest harborers of potential energy. They are also the most likely to adopt an area after the cleanup and beautification crew has moved on to browner pastures. This entry was posted on December 21, 2011 by C. Huelsman in Alleys and tagged alley, east alley.